Yes, and here is an example of what I call Mistake with a capital M. Apparently HP is shipping the HP Mininote netbook with a very dark protection film covering the webcam. The result a blurry and dark image. Yesterday a video was posted in youtube talking about this issue and showing how to fix it but it was mysteriously removed. Thanks to JKKMobile we can show you this whole issue and the fix. If you want to see your child really interested in practicing math all you need is a TabletPC. The Amazon Kindle 2 is to me a smart move of this company targeting in the near future the European market. A video review of the Amazon Kindle 2 eBook reader covering design, features, samples of text to speech reading aloud via the built-in speakers and comparisons with the Sony Reader 505 and Sony Reader PRS-700. It's unbelievable what can be done with a Tablet pc and a little bit of talent. We are living in a tuff time. We work some days like horses and any money we receive from our work seems to be not enough. So when you receive an email like this you feel really good. In the meantime I have moved my <name removed>.exe file to the same folder where all files of your program are located and it started to work properly – see attachment. I don’t know how good or bad is Microsoft Tech Support. I never have called them for support. But the fact that one of my customers is telling me this makes me feel happy. The Workshop on the Impact of Pen-Based Technology on Education (WIPTE) is accepting paper submissions for its 2009 conference. The deadline for submissions is June 15th, 2009. Submissions should describe experiences in deploying pen-based technology in educational environments. Papers will be accepted from both K12 and Higher Education institutions. All papers will be peer-reviewed. Selected papers will appear in a Monograph to be published by Purdue University Press and authors will present these papers at WIPTE 2009. Selection decisions will be announced by July 24th. WIPTE is open to anyone with an interest in instructional technology. A wide variety of disciplines are embracing Tablet PC's and similar pen-based devices as tools for the radical enhancement of teaching and learning. This conference is intended to leverage this shared passion and to identify best practices in the educational use of pen-based computing so that all educators may benefit from this next generation of technology. Each WIPTE paper presentation includes an assessment component as an important part of the presentation. The WIPTE program also includes keynote talks, poster presentations, vendor booths, panels, and special sessions. Windows 7 RC1 on February 27? According to a note published today at MSFN, Microsoft finalized the beta stage for Windows 7 and is currently working in the Release Candidate 1. According to the same note we could probably see the RC1 released as soon as February 27. The build string is indeed "7048.winmain_win7rc1.090211-1625," and it tells us much more than just than the fact that it was compiled on February 11, at 4:25PM (a week ago). What makes this build significant is not only that it's the first build (that we know of) compiled in February, or that it's the first 704x build we can confirm, but the inclusion of "rc1" in the string. This suggests that Microsoft has finished with beta builds and is now working on the RC1 branch builds. I really don’t know up to what point all this is real but I can say that Microsoft has been working in W7 with a speed that I never have seen before. So it would not surprise me at all if we begin March testing the RC1 and have by the end of June the RTM released. The SWD-M100 is, as far as I can remember, the first MID using Windows Mobile 6.1. Now, there’s a MID (mobile internet device) that we could use to blog on the go. 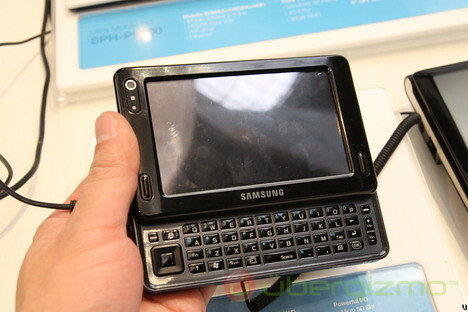 The Samsung SWD-M100D is a WiMax + WiFi device that has both a touch display and a sliding QWERTY keyboard. The most important feature (for live blogging) is the 3 Megapixel camera in the back, that should kick the battery of my Blackberry 8320 real hard. Nobody has been able to define a Tablet PC better than Bill Gates when he says that this devices are an evolution of Laptops. There who have used a Tablet PC never will go back to use a laptop. At least that's my experience. There are many Windows “Tweakers” out there but not many are freeware or made by a MVP. And this last point is very important when you are putting the stability of your OS in the hands of this type of software. Ultimate Windows Tweaker is Free and was made by Ramesh Kumar, MVP in Windows Desktop Experience. 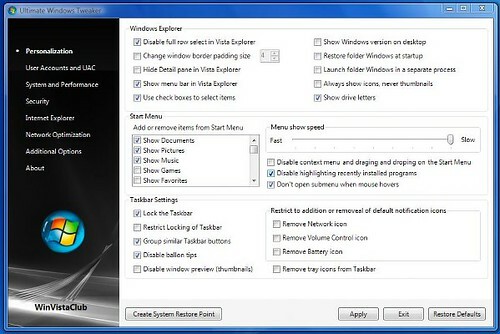 Ultimate Windows Tweaker is a freeware Tweak UI Utility for tweaking and optimizing Windows Vista, 32-bit & 64-bit. It can simply be downloaded and used as a portable application to customize your Windows Vista to meet your requirements. With judicious tweaking, It can make your system faster, more stable, and more secure with just a few mouse clicks. The tweaker detects whether you have IE 7 or IE 8 installed and accordingly offers you the relevant tweaks only. This Tweaker was released at the Microsoft South Asia MVP Meet 2008. MID are not for everybody. At least are not for me. Internet for me is more than a place to relax, it’s a place to work and then I need tools and more tools. And MID is just that a Mobile Internet Device. Without any other more complex tools that all you need to relax in Internet. And apparently my friend JKK suffers from the same kind of “illness” I have, because he has installed Windows XP in a MID converting it into an UMPC. In the above video we can see one of the closest thing I have seen to the original Origami Concept. According to the tickets filled by beta testers on this issue, Microsoft has fixed this issue. So that means that when the RC candidate is released we should not see this problem anymore. For now what I’m doing is not to map a network drive in my home network. I still copy files using the full path to those share folders when I need them. Speaking in English Tablet PC owners are lucky. We have been using the best handwriting recognition software available in the market for two years. In two years we have been able to train our TabletPCs to recognize virtually 99.99% of the time what ever we “draw” in our TIP. But the rest of the owners speaking other languages do not have this option available. The recognition is there and it’s good but there is not any way to train (personalize) it to be better. Well apparently this is going to change with W7. 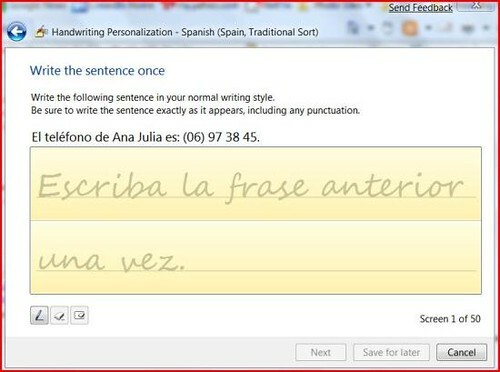 The handwriting personalization seems that will be available for other languages! That’s a real good news. Like many of you may know I live in a dual world writing in two languages and it was always sad for me to experience the difference between both recognitions, English and Spanish. Thanks to the personalization available in my English recognizer the recognition on this one was almost perfect but every time I had to write in Spanish I suffered seeing that the recognition % was not the same due to the lack of personalization in this other language. With W7 this has changed! I hope that this feature stays up to RTM version! Are you listening Microsoft! The tdx.sys BSOD that I was getting after installing any AntiVirus went away after installing build 7022. Now the system is working stable so far. The tdx.sys BSOD continues. I found that it happens if I have a network drive mapped and an Antivirus installed. The automatic screen rotation is not working and the auto turn on when you open the PC is not working. All the rest is working. About the alignment of the touch screen. Right after the installation you will find that the pen is off for a few millimeters close to the borders. Go to Windows Update, download the latest Intel Graphic Drivers. Once they are installed, do a reboot. After that go to Control Panel/Tablet PC Settings and use the calibration button in there. After the installation I prepared a folder with all the drivers for Vista. I went to my Device Manager and there where two unknown devices. One of them was the Authentec Fingerprint reader. I installed the driver for Vista and W7 detected an error, after checking for a solution in the web it pointed me to this W7 Beta Driver. After that I did a right click in the second unknown device when to update driver and selected the option to search in my HDD, pointing the search to that folder where I had all my Vista drivers. The search ended with a Fujitsu driver installed. I also imported this registry file to add 4 point rotation to Intel Drivers but I have to confess that I did not check if it was needed or not. One bad news. Readyboost is not longer working in my SDHC. I’ll have to spend a little more time on this point tonight. So I’m a happy camper again with W7 in my P1610. I noticed yesterday that W7 installed it own driver for the SD Drive and apparently is allowing me to use my SDHC Card for Readyboost! In Vista the speed test was not good enough for that task and now it’s! Like I said yesterday, I have finally W7 installed in my P1610. But… I have been suffering some BSOD talking about tdx.sys. Apparently many other testers have suffered the same problem. It seems to be relative with AV software and the network driver. I’ll play around tonight with both, the driver and the AV to see if I can finally have my P1610 stabilized. Rob at gottabemobile was pointing to a very good article about the Handwriting Recognition in Windows 7, the best I have ever seen. Windows has true cursive handwriting recognition, you don’t need to learn to write in a special way – in-fact, we’ve taught (or “trained” as we say) Windows the handwriting styles of thousands of people and Windows learns more about your style as you use it. Over the last 16 years we’ve developed powerful engines for recognizing handwriting, we continue to tune these to make them more accurate, faster and to add new capabilities, such as the ability to learn from you in Vista. Supporting a new language is much more than adding new dictionaries – each new language is a major investment. It starts with collecting native handwriting, next we analyze the data and go through iterations of training and tuning, and finally the system gets to you and continues to improve as you use it. 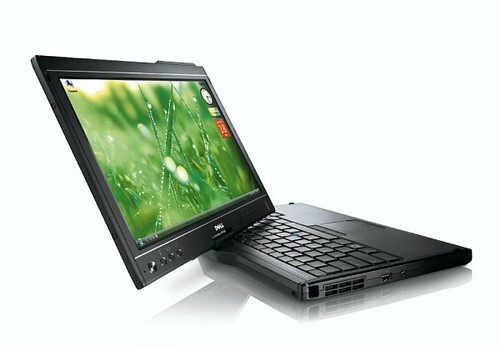 Dell has just released a new TabletPC, the XT2 with Multitouch! Multitouch is becoming more and more popular and it seems to me that in a near feature you won’t find a touch screen device without this feature. The news is all over the web, Amazon will start shipping the version of 2 of Kindle on February 24th, price: 359 dollars. You can check some pictures at engadget, page that is covering the Press Event Live. Well, this has been a painful process. I had enough space in my HDD to install W7 in a second partition but Vista was not giving me enough space to create that partition. Yesterday using Perfect Disk I finally got all my system files defragged and moved leaving me enough space to create the partition. I installed W7. The process was more or less fine. Most of the drivers worked from the beginning. The only ones that did not work were the BlueTooth and the Fingerprint reader. W7 installed a Fujitsu Touch screen driver. And there were one the complications started. First of all, I should have run Windows Update first to get the latest Intel Graphic Drivers and only after that to try to calibrate the touch screen. That’s how I did it in my Samsung Q1 and worked for me. In this case, I went to the Control Panel and I found an Icon from Fujitsu to calibrate the screen. That was another mistake. I should have calibrated it using the Calibration button from the Tablet PC Options. That use the calibration software from Microsoft. Anyway… at this moment I’m not so sure of what I should have done. The calibration was not working so to fix it I downloaded the latest driver from Intel, I tried to calibrate using the Fujitsu Icon and the Tablet PC settings but that did not fix anything. I uninstalled the Touch driver and Installed the latest one I had working in Vista. After that, when in the registry and deleted all the calibration data. Rebooted it, and calibrated again using just the Tablet PC Settings Calibration button (Microsoft TabCal). I noticed also that the calibration was not good in the Log On screen so I used this program developed by Angel Garcia at todoUMPC.com to fix that issue. I installed the BT drivers from Vista and that worked. Today when I get back home I’ll install the Beta Fingerprint Reader Drivers for W7. I’m getting BSOD when I’m using IE8. But I did not have time yesterday to check what is causing these BSOD. This pissed me off big time because so far I have installed W7 in 2 more machines and one Virtual Machine and it has been working stable in all of them. The only difference is that I did not have to install any drivers in those machines. In my P1610 I have few drivers that needed to be installed. Probably one of them is not working properly. One interesting point is that all the BSOD have been while using IE8. I’ll install today Firefox and see if that does not happen in this other browser. I’ll keep posting about my findings. I don't know you but I always have problems trying to find the right gift for Valentines Day. That's why this guide from TabletPC2.com seems to me just perfect. If you don’t have a second machine to test Windows 7 and you don’t want to create an extra partition in your main PC for this purpose you still can test it creating a Virtual Machine. 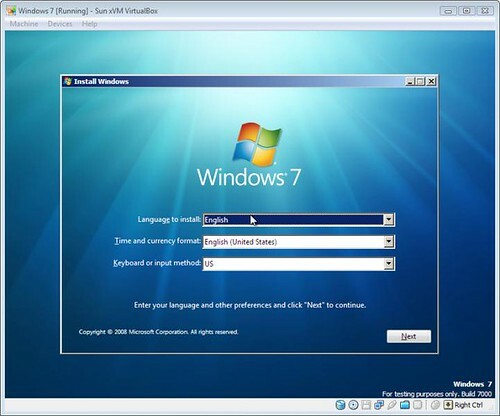 To create a Virtual Machine you can use Virtual PC 2007 from Microsoft, which is a freeware or you can use VirtualBox, here you can find the instructions of how to install W7 in a Virtual PC created using VirtualBox. In Microsoft's future vision on retailing there are two devices that are just irreplaceable: A Smart Phone and a Tablet PC. Rob Bushway from Gottabemobile has just posted his first impressions of HP’s Mini 1000 Mi Edition. I love the Mini 1000 and think it is one of the nicest netbooks on the market, but I have not found a scenario yet where I would recommend the Mi Edition over say the Windows XP version or the beta version of Windows 7. I know what is happening to Rob, after testing W7 it’s so hard to go back to Vista or XP! I have been reading about IE8 lately and I have to confess that even when I have not tested it yet I’m considering to drop Firefox and go back to IE8. The problem that I’m having with Firefox is that due to the amount of extensions I have running on Firefox, it’s slow and one of the reasons why I switched from IE to Firefox was performance. Now IE8 is about to be released and I have been reading news about new functionalities like this Web Slices from Live Search that seems to me really good. So what do you think guys, should I go back to IE8 or stay with my old friend Firefox?